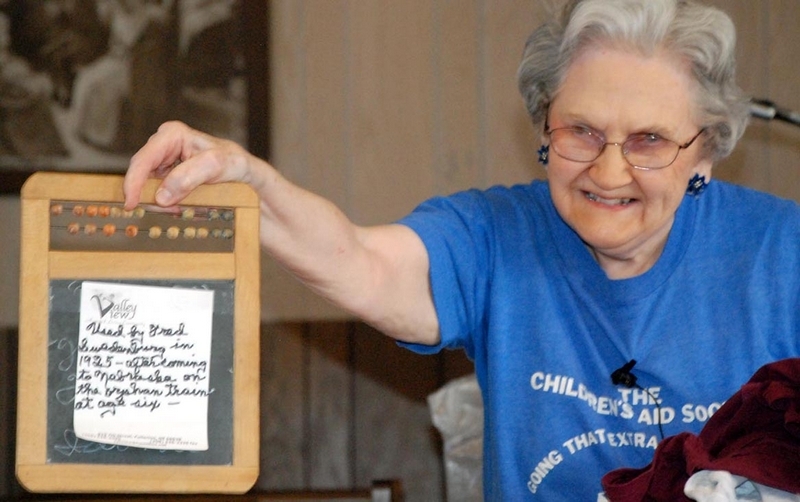 Barbara Ann Dush"Here's Freddie's little slate that he took with him when he started school," Idona Swedenburg said. When the Orphan Train movement began in the mid-19th century, approximately 30,000 abandoned children were trying to survive on the streets of New York. Often called “street urchins” or “waifs,” many were not true orphans but run-aways or merely “turned loose” by parents who couldn’t care for them. They could be found sleeping in doorways, living on streets, and fending for themselves by whatever means necessary. Charles Loring Brace, a 26-year-old Congregational minister, found his calling closer to street-level than the pulpit with his growing concern for homeless children. He joined together with other reformers and founded the Children’s Aid Society. He tried to help the children by establishing schools to teach them a trade and how to behave and dress. But just a year later, he knew more was needed. So he took up the plan Boston had tried 10 years earlier: taking orphans from the street, sending them west on trains, and placing them out to families at stops along the way. Today it is estimated that around two million people are descendants of an Orphan Train Rider. Two of those Nebraska descendants are Idona Swedenburg of Fullerton, Neb., and Jane Clements of Clarks, Neb. Idona’s late husband, Fred Swedenburg, and his brother Howard, rode the Orphan Train in 1925 to Osceola, Neb. “My husband was born in Canandaigua, New York, to Irene (Brown) and Fred Engert. We didn’t know until we’d been married for years that his middle name was Benjamin, but he never used it because he didn’t know he had one,” Idona said. Fred and Howard were removed from their home because of “scandalous neglect” and taken to the Children’s Aid Society. Fred was six-years-old and Howard was three when they were placed on the train. “A party of orphan children will come to Osceola September 22 under the auspices of the Children’s Aid Society, New York City. They are girls and boys from two to ten years of age, brought here with no expense to the people, placed on trial and if not satisfactory, the Society bears the expense of their removal. “We ask when applying for a child that you be able to satisfy the Society that you will be furnishing the child with home comforts, be a father and a mother to it, giving it education and religious training. A later article in the Osceola newspaper announced that seven children were brought and five of them had been placed and two had not. When Fred and Howard arrived in Osceola, they were chosen for placement but to separate homes. Fred was never adopted, but he remained with his Nebraska family, growing up on a farm by Clarks. After high school, Fred joined the Air Force, leaving Idona, his high school sweetheart, behind. When the lawyer asked the age of the boy and found out he was 24, he told Fred’s father he couldn’t adopt a full-grown man. Instead, the lawyer legally changed Fred’s last name to Swedenburg. Fred and Idona later married while he was home on furlough. While stationed in Detroit, Fred decided he wanted to look up his father in New York. “So he went out on the highway and stuck out his thumb and went to visit his father,” Idona said. That was until a fellow Orphan Train riders mentioned a meeting, and soon the couple was hosting Orphan Train meetings and attending state and national reunions. Fred and his brother were honored at a national meeting with a plaque, which was donated with Fred’s other Orphan Train memorabilia to the Merrick County Historical Museum in Central City, Neb.